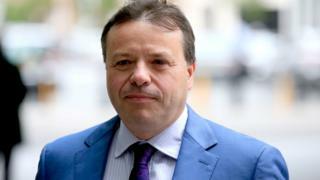 The Electoral Commission says it is investigating whether ex-UKIP donor Arron Banks broke donation rules during the EU referendum.The probe will look at whether the Leave.EU chairman broke the rules over donations or loans made to campaigners.It will also look at Better for the Country Ltd, a company of which Mr Banks is a registered director.Mr Banks said that a judge-led inquiry was needed "to clear this nonsense up once and for all".The commission said it launched investigations where there were "reasonable grounds" to believe offences had been committed. It is already carrying out separate probes into the spending returns submitted by the official Remain and Leave campaigns. Whether BFTC was the "true source of donations made to referendum campaigners in its name, or if it was acting as an agent". What steps the recipients took to verify BFTC's "identity and permissibility"
Whether any individual "facilitated a transaction with a non-qualifying person"
Bob Posner of the Electoral Commission said: "Interest in the funding of the EU referendum campaigns remains widespread. "Questions over the legitimacy of funding provided to campaigners at the referendum risks causing harm to voters' confidence. "It is therefore in the public interest that the Electoral Commission seeks to ascertain whether or not impermissible donations were given to referendum campaigners and if any other related offences have taken place. "In a statement issued by Leave.EU, Mr Banks said: "We believe that a judge-led inquiry reporting to Parliament that investigates the main campaign groups, Vote Leave, Britain Stronger In Europe and Leave.EU would be the best way to clear this nonsense up once and for all. "He said it should also cover why the Electoral Commission allowed a leaflet to be sent by the government to each home in the UK just before the referendum spending cut-off date.Mr Banks added: "The 'Remain' Electoral Commission isn't up to the job and consists of political placemen from all main parties. "This is the Remain establishment once again trying to discredit the result and it's all starting to get rather boring."